She stood on skis for the first time in 2013 – and they were borrowed skis! 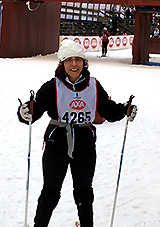 Now, just last week, Solmaz Filiz Karabag completed the “Half of Vasaloppet”, probably the first Turkish woman to do so. Now she has her sights set on the Swedish Classic Circuit – a challenge of events in four endurance sports: cross country skiing, cycling, open water swimming, and cross country running. When Solmaz Filiz Karabag arrived in Sweden and came to LiU as guest doctoral student for the first time in 2005, she had not been running since childhood, never been on a bike, and her swimming was not impressive. And skiing – well, you could forget about that. So after her boyfriend and a colleague had nagged her enough, Solmaz borrowed some skis and tried it out around the golf course. Linköping doesn’t get much snow, and opportunities for training are limited. Solmaz took trips to northern Sweden with her boyfriend a few times and took lessons from a skiing teacher. 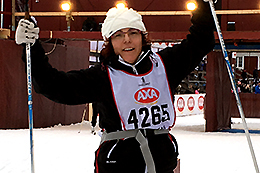 It worked so well that Solmaz entered the “Half of Vasaloppet”, a 45-kilometre ski race in Dalarna, this year. Winter sports are not very popular in Turkey, even though there is quite a lot of snow in eastern Turkey and it can get really cold. When Solmaz was growing up, her brothers sometimes went downhill skiing, but Solmaz never went with them. Looking through the results database for Vasaloppet, Solmaz Filiz Karabag and one other woman have stated that they come from Turkey, but the other participant has a typically Swedish name. So it’s possible that Solmaz is the first woman from Turkey to compete in Vasaloppet! Solmaz has been back and forth between Turkey and Sweden a few times now. She was awarded a post-doc scholarship and returned to LiU in 2008. After this she returned to Turkey, but was back again in Sweden in 2011 to take up a post at Södertörn University as senior lecturer in tourism. In 2013 she came back to LiU as docent and senior lecturer in industrial organisation at the Department of Management and Engineering. Solmaz is planning to take part in “Öppet spår”, the full length of Vasaloppet, in 2018 and then continue to complete the Swedish Classic Circuit challenge in 2019. She’s planning on improving her swimming during the summer, and has found a good swimming club in Linköping. It’s the same with Solmaz’ running. She hadn’t run since playing as a child, until someone persuaded her to take part in Blodomloppet, a 10-kilometre team running event organised by the blood donation service in Sweden. You appear to be extremely focussed. What motivates you?